''Choose Your Charity'' Vote for TCM Counseling! 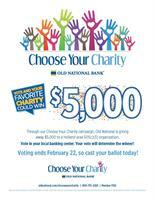 Old National Bank is running a "Choose your Charity" contest that will give $5,000 to an area non-profit! WOW! We NEVER turn anyone away. Ever. We also offer FREE group suicide prevention trainings (QPR), and bring therapists into 27 schools in six (6) different school systems (Including Holland, West Ottawa & Zeeland Public schools) to counsel kids (K-12) who would not have any access to counseling if not for TCM. Voting must be done in person, you're allowed to vote DAILY, and goes until 2/22/19. Old National Bank is located right downtown Holland at 100 E. 8th Street. (right by Knickerbocker theater) You DO NOT need an account to vote!